Improved wetting characteristics together with improved release characteristics with respect to a substrate and an imprint lithography mold having imprinting material disposed therebetween. The present application is a continuation of U.S. application Ser. No. 11/244,428, filed Oct. 5, 2005, now allowed, which is a continuation of U.S. patent application Ser. No. 10/763,885, filed Jan. 23, 2004, now abandoned, and a continuation of U.S. patent application Ser. No. 11/068,397, filed Feb. 28, 2005, now abandoned. U.S. patent application Ser. No. 11/068,397 claims priority to U.S. Provisional Patent Application No. 60/631,029, filed Nov. 24, 2004, and is a continuation-in-part of U.S. patent application Ser. No. 11/012,374 and also a continuation-in-part of U.S. patent application Ser. No. 11/012,375, both filed Dec. 15, 2004 and now both abandoned. All of the aforementioned patent applications are hereby incorporated herein by reference in their entirety. The field of invention relates generally to nano-fabrication of structures. More particularly, the present invention is directed to a method of providing desirable wetting and release characteristics between a mold and a polymerizable composition suitable for use in imprint lithographic processes. Nano-scale fabrication involves the fabrication of very small structures, e.g., having features on the order of one nano-meter or more. A promising process for use in nano-scale fabrication is known as imprint lithography. Exemplary imprint lithography processes are described in detail in numerous publications, such as U.S. Pat. No. 6,980,259; U.S. Patent Application Publication No. 2004/065252; and U.S. Pat. No. 6,936,194, all of which are assigned to the assignee of the present invention. Referring to FIG. 1, the basic concept behind imprint lithography is forming a relief pattern on a substrate that may function as, inter alia, an etching mask so that a pattern may be formed into the substrate that corresponds to the relief pattern. A system 10 employed to form the relief pattern includes a stage 11 upon which a substrate 12 is supported. A template 14 has a mold 16 with a patterning surface 18 thereon. Patterning surface 18 may be substantially smooth and/or planar, or may be patterned so that one or more recesses are formed therein. Template 14 is coupled to an imprint head 20 to facilitate movement of template 14. A fluid dispense system 22 is coupled to be selectively placed in fluid communication with substrate 12 so as to deposit polymerizable material 24 thereon. A source 26 of energy 28 is coupled to direct energy 28 along a path 30. Imprint head 20 and stage 11 are configured to arrange mold 16 and substrate 12, respectively, to be in superimposition, and is disposed in path 30. Either imprint head 20, stage 11, or both vary a distance between mold 16 and substrate 12 to define a desired volume therebetween that is filled by polymerizable material 24. Another prior art attempt to improve release properties is described by Bender et al. in “Multiple Imprinting in UV-based Nanoimprint Lithography: Related Material Issues,” Microeletronic Engineering, 61-62 (2002), pp. 407-413. Specifically, Bender et al. employ a mold having an a priori release layer in conjunction with a fluorine-treated UV curable material. To that end, a UV curable layer is applied to a substrate by spin-coating a 200 cPs UV curable fluid to form a UV curable layer. The UV curable layer is enriched with fluorine groups to improve the release properties. A drawback with the release layers of the prior art is that the same usually increases the time required to wet a surface, thereby reducing the overall throughput of the process. This, it is believed, results from the hydrophobicity of the release layers. Specifically, the hydrophobicity is inversely related to the work required to achieve release and directly related to the time required to wet a surface. Thus, there is a conflict between the wetting characteristics and the release characteristics desired for imprint lithographic processes. The present invention provides a method that features compositions that feature improved wetting characteristics while allowing preferential adhesion and release characteristics with respect to a substrate and a mold having imprinting material disposed therebetween. The method includes coating a surface of the mold with a volume of surfactant containing solution. The surfactant in the solution includes a hydrophobic component consisting essentially of a plurality of fluorine-containing molecules. The distribution of the plurality of fluorine-containing molecules throughout the volume provides a desired contact angle with respect to a polymerizable composition disposed on the substrate. The contact angle is in a range of 50° or less. These and other embodiments are described herein. FIG. 1 is a perspective view of a lithographic system in accordance with the prior art. FIG. 2 is a simplified elevation view of a template and imprint material disposed on a substrate in accordance with the present invention. FIG. 3 is a simplified elevation view of the template and substrate shown in FIG. 2, with the imprinting material being shown as patterned and solidified. FIG. 4 is a detailed view of the droplets of imprint material, shown in FIG. 2, showing the bifurcation of the droplets into surfactant-rich regions and surfactant-depleted regions. FIG. 5 is a detailed view of a layer of imprinting material, deposited employing spin-on techniques, showing the bifurcation of the layer into surfactant-rich regions and surfactant-depleted regions. FIG. 6 is a cross-sectional view of the template contacting imprinting material, deposited as shown in either FIG. 4 or 5, demonstrating the formation of the weak boundary lamella between solidified imprinting material and a template. FIG. 8 is a graph showing separation data concerning bulk material A1. FIG. 9 is a graph showing separation data concerning bulk material A2. FIG. 10 is a graph showing separation data concerning bulk material A3. FIG. 11 is a graph showing separation data concerning bulk material A4. FIG. 12 is a graph showing separation data concerning bulk material A5. FIG. 13 is a graph showing separation data concerning bulk material A6. Referring to FIGS. 1 and 2, a mold 36, in accordance with the present invention, may be employed in system 10, and may define a surface having a substantially smooth or planar profile (not shown). Alternatively, mold 36 may include features defined by a plurality of spaced-apart recessions 38 and protrusions 40. The plurality of features defines an original pattern that is to be transferred into a substrate 42. Substrate 42 may be comprised of a bare wafer or a wafer with one or more layers disposed thereon. To that end, reduced is a distance “d” between mold 36 and substrate 42. In this manner, the features on mold 36 may be imprinted into a conformable region of substrate 42, such as an imprinting material disposed on a portion of surface 44 that presents a substantially planar profile. It should be understood that the imprinting material may be deposited using any known technique, e.g., spin-coating, dip coating and the like. In the present example, however, the imprinting material is deposited as a plurality of spaced-apart discrete droplets 46 on substrate 42. Imprinting layer 34 is formed from a composition that may be selectively polymerized and cross-linked to record the original pattern therein, defining a recorded pattern. The constituent components that form the imprinting material to provide the aforementioned characteristics may differ. This results from substrate 42 being formed from a number of different materials. As a result, the chemical composition of surface 44 varies dependent upon the material from which substrate 42 is formed. 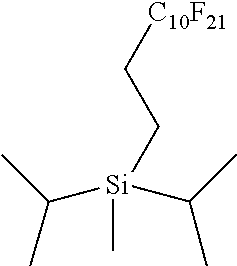 For example, substrate 42 may be formed from silicon, plastics, gallium arsenide, mercury telluride, and composites thereof. Additionally, substrate 42 may include one or more layers, e.g., dielectric layer, metal layer, semiconductor layer, planarization layer and the like, upon which formation 50 is generated. Additionally, mold 36 may be formed from several materials, e.g., fused-silica, quartz, indium tin oxide diamond-like carbon, MoSi, sol-gels and the like. It was discovered, however, that desirable preferential adhesion and release properties, as discussed above, may be achieved by producing a weak boundary layer, lamella 60, between mold 36, surface 58 and formation 50. Lamella 60 remains after solidification of the imprinting material. As a result, the adhesion forced between mold 36 and formation 50 are minimal. To that end, found beneficial was employing a composition for the imprinting material that includes one of the bulk materials discussed above along with a component that contains low surface energy groups, referred to herein as a surfactant component. After deposition of the imprinting material, the surfactant component rises, after a period of time, to the air liquid interface, providing droplets 146 of imprinting material with a bifurcated concentration of materials. In a first portion, droplets 146 include a higher concentration of the surfactant component, referred to as a surfactant-component-rich (SCR) sub-portion 136, than the second portion, referred to as a surfactant-component-depleted (SCD) sub-portion 137. SCD sub-portion 137 is positioned between surface 44 and SCR sub-portion 136. SCR sub-portion 136 attenuates the adhesion forces between mold and the imprinting material, once solidified. Specifically, the surfactant component has opposed ends. When the imprinting material is in the liquid phase, i.e., polymerizable, one of the opposed ends has an affinity for the bulk material included in the imprinting material. The remaining end has a fluorine component. As a result of the affinity for the bulk material, the surfactant component is orientated so that the fluorine component extends from an air-liquid interface defined by the imprinting material and the surrounding ambient. Upon solidification of the imprinting material, a first portion of the imprinting material generates a lamella 60 and a second portion of the imprinting material is solidified, i.e., polymeric material shown as formation 50. Lamella 60 is positioned between formation 50 and mold 36. Lamella 60 results from the presence and location of the fluorine components in the SCR sub-portion 136. Lamella 60 prevents strong adhesion forces from being developed between mold 36 and formation 50. Specifically, formation 50 has first and second opposed sides 62 and 64. Side 64 adheres to substrate 42 with a first adhesion force. Side 62 adheres to mold 36 with a second adhesion force. Lamella 60 results in the second adhesion force being less than the first adhesion force. As a result, mold 36 may be easily removed from formation 50 while minimizing distortions and/or the force required to separate mold 36 therefrom. Although formation 50 is shown with side 62 being patterned, it should be understood that side 62 may be smooth, if not planar. Furthermore, if desired, it is possible to generate lamella 60 so as to be disposed between formation 50 and substrate 42. This may be achieved, for example, by applying imprinting material to mold 36 and subsequently contacting substrate with the imprinting material. In this manner, it can be said that formation 50, i.e., polymeric material, will be disposed between lamella 60 and the body, mold 36 or substrate 42, upon which the polymerizable material is deposited. 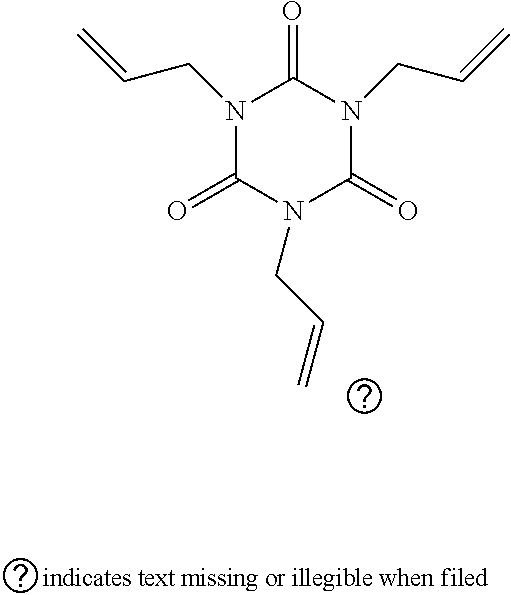 where R and R′ can be either H or methyl; R and R′ can be identical or differ. R″ is a linking group that may be omitted or a sulfonyl group such as —SO2N(R′″″)—, with R′″″ being C1 to C6 alkyl and typically C1 to C4 alkyl. The component (OR′″)z is a poly(oxyalkylene) group, typically including groups having 2 to 4 carbon atoms such as —CH2CH2—, —CH2CH2CH2—, —CH(CH3)CH2—, or —CH(CH3)CH(CH3)—. R″″ is a terminal group of methyl, H or C1 to C4 alkyl and typically H or methyl. The ratio of x to y is in a range of 1:2 to 3:1 and more preferably in a range of 1:1 to 2:1. Typically, the composition formed employing the bulk materials mentioned above includes a quantity of surfactant components, or mixture of surfactant components, that is in a range of 0.05% to 5% of the composition by weight, and more particularly 0.25% to 2% by weight. The remaining portion of the composition comprises one or more of the bulk materials, described above. Typically the composition from which the imprinting material is fabricated is applied employing either drop-dispense techniques at room temperatures and in the presence of a helium-purged environment, e.g., a helium-saturated atmosphere. The drop-dispense technique is employed for compositions having viscosities in a range of 1-20 cPs at room temperature. For higher viscosity compositions, e.g., in a range of 10-500,000 cPs, but more particularly, compositions from 10-20,000 cPs, at room temperature, spin-coating techniques may be employed. The surfactant components and bulk materials described above were employed to formulate additional compositions to generate comparative data of the preferential adhesion and preferential release properties with respect to the twelve compositions and the eight bulk materials, discussed above. The compositions and/or bulk materials were deposited and then solidified between two glass slides. Each glass slide was approximately 1 mm thick, 75×25 mm in the lateral dimension. Droplets of fluidic imprinting material were disposed on a glass slide; the second slide was laid in a cross direction pattern. The imprinting material was subsequently cured. A four-point bending compression force was applied to separate the slides. To that end, a four-point bending fixture (not shown) was adopted for the adhesion test and technique, similar to that described in “Measurement of Adhesive Force Between Mold and Photocurable Resin in Imprint Technology” Japanese Journal of Applied Physics, Vol. 41 (2002) pp. 4194-4197. The maximum force/load was taken as the adhesion value. The beam distance of the top and bottom two points is 60 mm. The load was applied at the speed of 0.5 mm per minute. The compositions and test results are as shown in FIG. 8. As seen in FIG. 8, for composition A1, only 3.4 pounds of separation force is required to separate superimposed glass-slides (not shown) having a cured imprinting material disposed therebetween formed from a composition bulk material A1 and surfactant S2, shown as A1-S2. This is much less than the 7.5 pounds of separation force required to separate cured imprinting material formed from a composition of about 99.5% bulk material A1 and about 0.5% surfactant S1, shown as A1-S1. More telling is the 61% reduction in the separation force realized when compared to the separation force required to separate superimposed glass slides (not shown) having a cured bulk material A1, disposed therebetween, not having a surfactant included therein, shown as A1-NS. The A1-NS, A1-S1 and A1-S2 compositions each have a room temperature viscosity of approximately 8 cPs and deposited at room temperature employing drop-dispense techniques. The A1-S2 composition consisted of approximately 99.5% of bulk material A1 and 0.5% of surfactant S2. The A1-S1 composition consisted of approximately 99.5% of bulk material A1 and 0.5% of surfactant S1. As seen from the separation data concerning bulk material A2 shown in FIG. 9, 1.7 pounds of separation force was required to separate superimposed glass-slides (not shown) having cured imprinting material. 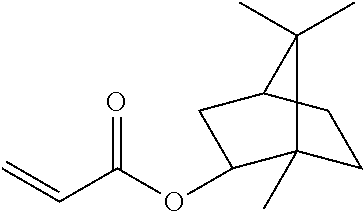 A composition containing bulk material A2 and surfactant S3, shown as A2-S3 was employed to form the cured imprinting material. This separation force required is much less than the 2.6 pounds of separation force required in the presence of cured imprinting material formed from a composition of bulk material A2 and surfactant S4, shown as A2-S4. More telling is the 50% reduction in the separation force realized when compared to the separation force required to separate superimposed glass slides (not shown) having a cured bulk material A2, disposed therebetween, in the absences of a surfactant, shown as A2-NS. The A2-NS, A2-S3 and A2-S4 compositions each has a room temperature viscosity of approximately 300 cPs and deposited at room temperature employing spin-on techniques. The A2-S3 composition consisted of approximately 99.5% of bulk material A2 and 0.5% of surfactant S3. The A2-S4 composition consisted of approximately 99.5% of bulk material A2 and 0.5% of surfactant S4. As seen from the separation data concerning bulk material A3 shown in FIG. 10, only 2.0 pounds of separation force was required to separate superimposed glass-slides (not shown) having a cured imprinting material disposed therebetween. The cured imprinting material was formed from a composition containing bulk material A3 and surfactant S4, shown as A3-S4. This is much less than the 3.0 pounds of separation force required in the presence of cured imprinting material formed from composition of bulk material A3 and surfactant S1, shown as A3-S1. The separation force associated with A3-S4 is also less than the separation force required in the presence of cured imprinting material formed from a composition of bulk material A3 and surfactant S3, shown as A3-S3. More telling is the 72% reduction in the separation force realized when compared to the separation force required to separate superimposed glass slides (not shown) having a cured bulk material A3, disposed therebetween, in the absence of a surfactant, shown as A3-NS. The A3-NS, A3-S1, A3-S3 and A3-S4 compositions each has a room temperature viscosity in a range of approximately 10,000 to 12,000 cPs, inclusive, and deposited at room temperature employing spin-on techniques. The A3-S1 composition consisted of approximately 99.5% of bulk material A3 and 0.5% of surfactant S1. The A3-S3 composition consisted of approximately 99.5% of bulk material A3 and 0.5% of surfactant S3. The A3-S4 composition consisted of approximately 99.5% of bulk material A3 and 0.5% of surfactant S4. As seen from the separation data concerning bulk material A4 shown in FIG. 11, the reduction of forces required for separating the superimposed glass-slides (not shown) having a cured composition disposed therebetween containing bulk material A4 and surfactant S4, shown as A4-S4, required only 5.0 pounds. This is less than the 5.4 pounds of separation force required for a composition of bulk material A4 and surfactant S3, shown as A4-S3. More telling is the 40% reduction in the separation force realized when compared to the separation force required to separate superimposed glass slides (not shown) having a cured bulk material A4, disposed therebetween, in the absence of a surfactant, shown as A4-NS. The A4-NS, A4-S3 and A4-S4 compositions each has a room temperature viscosity approximately 5,000 cPs and deposited at room temperature employing spin-on techniques. The A4-S1 composition consisted of approximately 99.5% of bulk material A4 and 0.5% of surfactant S1. The A4-S3 composition consisted of approximately 99.5% of bulk material A4 and 0.5% of surfactant S3. The A4-S4 composition consisted of approximately 99.5% of bulk material A4 and 0.5% of surfactant S4. As seen from the separation data concerning bulk material A5 in FIG. 12, only 0.62 pounds of separation force is required for separating the superimposed glass-slides (not shown) having a cured imprinting material disposed therebetween. The cured imprinting material was formed from a composition of bulk material A5 and surfactant S3, shown as A5-S3. This is less than the separation force required for cured imprinting material formed from a composition of either bulk material A5 and surfactant S1, shown as A5-S1 or bulk material A5 and surfactant S4, shown as A5-S4. More telling is the 72% reduction in the separation force realized when compared to the separation force required to separate superimposed glass slides (not shown) having a cured bulk material A5, disposed therebetween, in the absence of a surfactant, shown as A5-NS. The A5-NS, A5-S1, A5-S3 and A5-S4 compositions each has a room temperature viscosity in a range of approximately 20 to 30 cPs, inclusive, and deposited at room temperature employing spin-on techniques. The A5-S1 composition consisted of approximately 99.5% of bulk material A5 and 0.5% of surfactant S1. The A5-S3 composition consisted of approximately 99.5% of bulk material A5 and 0.5% of surfactant S3. The A5-S4 composition consisted of approximately 99.5% of bulk material A5 and 0.5% of surfactant S4. The data suggests that selective adhesion has been achieved. Although S3 and S5 have perfluoro-hydrophobic groups, S3 appears to be much more efficient in reducing the adhesion than S5. It is believed, therefore, that structure variations of the fluorinated additives will have significant impacts on the release performance. For example, S3 has a surfactant molecule that contains both a hydrophobic tail and a hydrophilic head, which as shown provides desirable release characteristics. The A6-NS, A6-S3 and A6-S5 compositions have a room temperature viscosity of approximately 4 cPs and deposited at room temperature employing drop-dispense techniques. The A6-S3 composition consisted of approximately 99.5% of bulk material A6 and 0.5% of surfactant S3. The A6-S5 composition consisted of approximately 99.5% of bulk material A6 and 0.5% of surfactant S5. Bulk material A7-1 is identical to BULK MATERIAL-A7 in terms of the identity of the constituent components, excepting the addition of a surfactant component. The two materials differ in terms of the percentage of each of the constituent components present. In Bulk Material A7-1, approximately 46.875% of the composition by weight is IBOA, 24.875% of the composition by weight is nHA, 24.875% of the composition by weight is EGDA, 2.875% of the composition by weight is Darocur 1173; and approximately 0.5% of the composition being a surfactant component. Specifically, with 0.5% of the Bulk Material A7-1 consisting of the surfactant FSO-100, the least desirable wettability characteristics are provided. The contact angle is the greatest at 43.2°. Compare the contact angle of 13.8° provided upon Bulk Material A7-1 consisting of 0.5% of the combination surfactant R-08 and FC-4430, wherein R-08 and FC-4430 each comprises 0.25% of Bulk Material A7-1. As a result, the time required to fill the features of mold 36 is less for layer 70 including combination surfactant R-08 and FC-4430 than for layer 70 including FSO-100. For the remaining measurements, a contact angle of approximately 20.2° when the combination surfactant FC-4430 and FC-4432 included in the Bulk Material A7-1 wherein FC-4430 comprises approximately 0.333% of the composition by weight and FC-4432 comprises approximately 0.167% of the composition by weight. 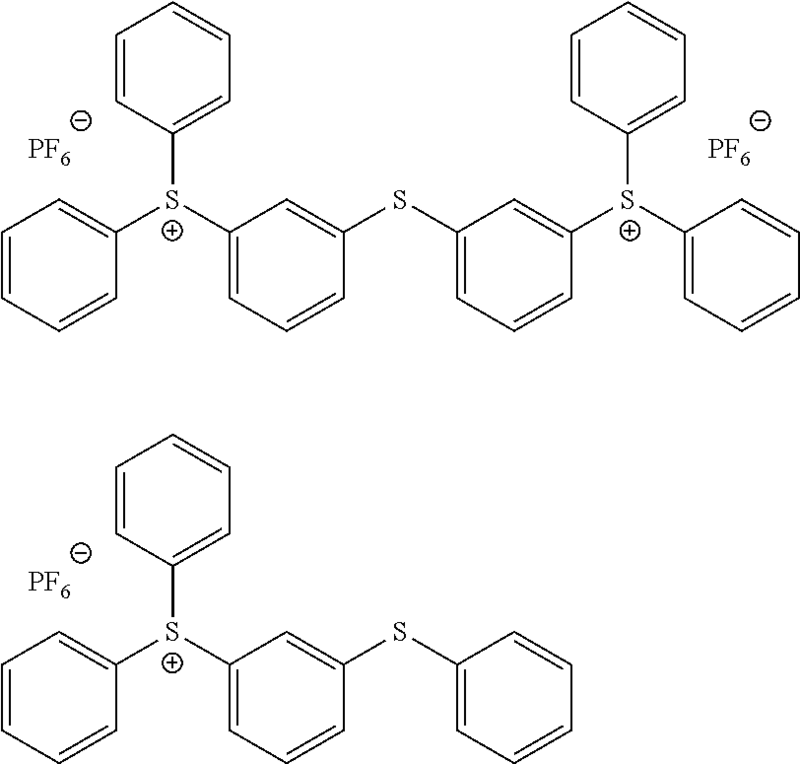 Another surfactant combination consisting of R-08 and FS-1230 presented a contact angle of approximately 22.7°, in which R-08 comprised of approximately 0.4% by weight of Bulk Material A7-1, by weight, and FS-1230 comprised of approximately 0.1% of Bulk Material A7-1, by weight. Bulk material A8-1 is identical to BULK MATERIAL-A8 in terms of the identity of the constituent components, excepting the addition of a surfactant component. The two materials differ in terms of the percentage of each of the constituent components present. In Bulk Material A8-1, approximately 20.875% of the composition by weight is the acrylate component Genomer 1122 and 55.875% of the composition by weight is IBOA. 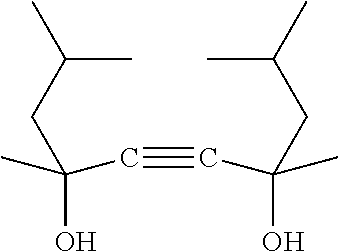 The acrylate component HDODA is approximately 19.875% by weight, and Darocur 1173 is approximately 2.875% of the composition by weight. The remaining 0.5% of the composition is a surfactant component. Specifically, with 0.5% of the Bulk Material A8-1 consisting of FSO-100, the least desirable wettability characteristics are provided. The contact angle is the greatest at 49.7°. Compare the contact angle of 17.2% provided upon Bulk Material A8-1 consisting of 0.5% of the surfactant FC-4430. As a result, the time required to fill the features of mold 36 is less for layer 70 including surfactant FC-4430 than for layer 70 including FSO-100. For the remaining measurements, a contact angle of approximately 18.2° was presented when the R-08 surfactant is included in Bulk Material A8-1. With surfactant S-222N included in Bulk Material A8-1 a contact angle of 19.2° is presented, and a contact angle of 21.4° is presented when the surfactant FS-2000 is included in Bulk Material A8-1. A contact angle of 26.5° is presented when surfactant FC-4432 is included in Bulk Material A8-1. Bulk material A7-2 includes all of the constituent components of material A7-1 and includes a surfactant FSO-100. In Bulk Material A7-2, approximately 46.875% of the composition by weight is IBOA, 24.875% of the composition by weight is nHA, 24.875% of the composition by weight is EGDA, 2.875% of the composition by weight is Darocur 1173; and approximately 0.5% of which is FSO-100. Specifically, with surface 58 coated with the IPA mixture including FSO-100, the least desirable wettability characteristics are provided, with the contact angle being the greatest at 43.2°. With surface 58 coated with the combination surfactant R-08 and FC-4430, each of which comprises 0.5% of the IPA mixture, that contact angle presented is 14.7°. For the remaining measurements, a contact angle of approximately 18.1° is presented when surface 58 is coated with the FC-4430 surfactant, and a contact angle of approximately 20° is presented when surface 58 is coated with the R-08 surfactant. When surface 58 is coated with a combination surfactant including FC-4430 and FC-4432 deposited in layer 70, a contact angle of approximately 22° is presented. 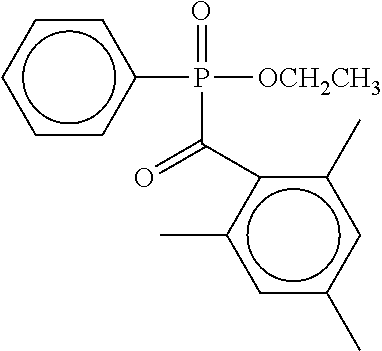 FC-4430 comprises 0.333% of the IPA mixture and FC-4432 comprises 0.167% of the IPA mixture, by weight. When surface 58 is coated with FC-4432, absent any other surfactant, a contact angle of approximately 26.0° is presented. As can be seen, therefore, by properly selecting the surfactant component in each of the bulk materials, the desired wetting characteristics may be obtained, along with the desired preferential adhesion and release characteristics. wherein less force is required to separate a first polymerized layer from the surface of the imprint lithography mold with the quantity of the first surfactant disposed thereon than to separate a second polymerized layer from the surface of the imprint lithography mold with the similar quantity of the second surfactant disposed thereon, the first polymerized layer formed by contacting the first polymerizable composition with the surface of the imprint lithography mold having the quantity of the first surfactant disposed thereon and polymerizing the first polymerizable composition between the surface of the imprint lithography mold having the quantity of the first surfactant disposed thereon and the imprint lithography substrate, and the second polymerized layer formed by contacting the second polymerizable composition with the surface of the imprint lithography mold having the similar quantity of the second surfactant disposed thereon and polymerizing the second polymerizable composition between the surface of the imprint lithography mold having the similar quantity of the second surfactant disposed thereon and the imprint lithography substrate. 2. The imprint lithography mold assembly of claim 1, wherein the surface of the imprint lithography mold having the quantity of the first surfactant disposed thereon does not have an a priori release layer. 3. The imprint lithography mold assembly of claim 1, wherein a contact angle of the first polymerizable composition on the surface of the imprint lithography mold having the quantity of the first surfactant disposed thereon is less than a contact angle of the second polymerizable composition on the surface of the imprint lithography mold having the similar quantity of the second surfactant disposed thereon. 4. The imprint lithography mold assembly of claim 3, wherein the contact angle of the second polymerizable composition on the surface of the imprint lithography mold having the similar quantity of the second surfactant disposed thereon is greater than 40°. 5. The imprint lithography mold assembly of claim 3, wherein the contact angle of the first polymerizable composition on the surface of the imprint lithography mold having the quantity of the first surfactant disposed thereon is about 26.5° or less. 6. The imprint lithography mold assembly of claim 5, wherein the contact angle of the first polymerizable composition on the surface of the imprint lithography mold having the quantity of the first surfactant disposed thereon is less than about 20°. 7. The imprint lithography mold assembly of claim 1, wherein the first polymerizable composition comprises a a third surfactant together with the additional quantity of the first surfactant. 8. The imprint lithography mold assembly of claim 1, wherein a third surfactant is disposed on the surface of the imprint lithography mold together with the quantity of the first surfactant. 9. The imprint lithography mold assembly of claim 1, wherein a third surfactant is disposed on the surface of the imprint lithography mold together with the quantity of the first surfactant, and the first polymerizable composition comprises the third surfactant together with the additional quantity of the first surfactant. 10. The imprint lithography mold assembly of claim 1, wherein a lamella layer comprising a portion of the first surfactant disposed on the surface of the imprint lithography mold and a portion of the first surfactant in the first polymerizable composition is present between the first polymerized layer and the surface of the imprint lithography mold on which the quantity of the first surfactant is disposed after contacting the first polymerizable composition with the surface of the imprint lithography mold having the quantity of the first surfactant disposed thereon and polymerizing the first polymerizable composition. 11. The imprint lithography mold assembly of claim 10, wherein a thickness of the lamella layer is about 1 nm. wherein less force is required to separate the first polymerized layer from the surface of the imprint lithography mold with the quantity of the first surfactant disposed thereon than to separate a second polymerized layer from the surface of the imprint lithography mold with the similar quantity of the second surfactant disposed thereon, the second polymerized layer formed by contacting the second polymerizable composition with the surface of the imprint lithography mold having the similar quantity of the second surfactant disposed thereon and polymerizing the second polymerizable composition between the surface of the imprint lithography mold having the similar quantity of the second surfactant disposed thereon and the imprint lithography substrate. 13. The imprint lithography mold assembly of claim 12, wherein a thickness of the lamella layer is about 1 nm. 14. The imprint lithography mold assembly of claim 12, wherein the surface of the imprint lithography mold having the quantity of the first surfactant disposed thereon does not have an a priori release layer. wherein less force is required to separate the first polymerized layer from the surface of the mold with the quantity of the first surfactant disposed thereon than to separate a second polymerized layer from the surface of the mold with the similar quantity of the second surfactant disposed thereon, the second polymerized layer formed by contacting the second polymerizable composition with the surface of the imprint lithography mold having the similar quantity of the second surfactant disposed thereon and polymerizing the second polymerizable composition between the surface of the imprint lithography mold having the similar quantity of the second surfactant disposed thereon and the imprint lithography substrate. 16. The imprint lithography method of claim 15, wherein the surface of the imprint lithography mold having the quantity of the first surfactant disposed thereon does not have an a priori release layer. 17. The imprint lithography method of claim 15, wherein the contact angle of the second polymerizable composition on the surface of the imprint lithography mold having the similar quantity of the second surfactant disposed thereon is greater than 40°. 18. The imprint lithography method of claim 15, wherein the contact angle of the first polymerizable composition on the surface of the imprint lithography mold having the quantity of the first surfactant disposed thereon is about 26.5° or less. 19. The imprint lithography method of claim 18, wherein the contact angle of the first polymerizable composition on the surface of the imprint lithography mold having the quantity of the first surfactant disposed thereon is less than about 20°. 20. The imprint lithography method of claim 15, further comprising forming a lamella layer between the first polymerized layer and the surface of the imprint lithography mold on which the quantity of the first surfactant is disposed, the lamella layer comprising a portion of the first surfactant disposed on the surface of the imprint lithography mold and a portion of the first surfactant in the first polymerizable composition.